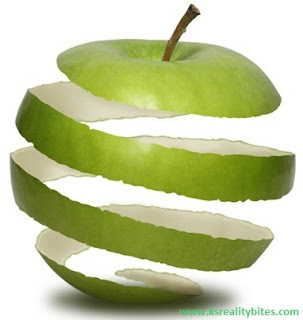 KSRealityBites: Natural substance in apple peel reduces obesity! Natural substance in apple peel reduces obesity! A recent study conducted by the researchers at the University of Iowa, in the United States, claims that a natural substance found in apple peel may help reduce obesity & its associated health problems. The waxy compound in apple peel known as ursolic acid actually said to increase the amount of muscle & brown fat, the two tissues recognized for their calorie-burning properties which eventually leads to reduce obesity. The research team included Steven Kunkel, Christopher Elmore, Kale Bongers, Scott Ebert, Daniel Fox, Steven Bullard & Michael Dyle who studied mice on a high-fat diet over a period of several weeks. They took some mice & kept them on a high-fat diet including apple & after some weeks found that the compound increased skeletal muscle & reduced obesity. The increase in muscle is very good at burning calories. Hence the increased muscle in ursolic acid-treated mice may be sufficient to explain how the compound reduces obesity - they advocated. Again, the researchers were surprised to see that it also increased brown fat, a fantastic calorie burner. Increase in brown fat may also help protect against obesity. The findings of the study were published in the journal PLoS ONE & the study was led by Christopher Adams, associate professor of internal medicine. About brown fat, until now the researchers were of the belief that only infants had brown fat, which then disappeared during childhood but the latest imaging techniques have shown that adults also retain a very small amount of the substance mostly in the neck & between the shoulder blades. Some studies have linked increased levels of brown fat with lower levels of obesity leading to the suggestion that brown fat may be helpful in preventing obesity & diabetes. Interesting info. So next time it is better not to peel the apple, right? thanks for sharing.